Dungannon Swifts boss Rodney McAree believes the only way is up for his team. 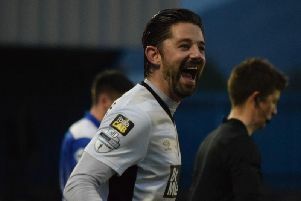 McAree walked away from the Oval on Saturday with a huge smile on his face following this gutsy performance against an off-colour Glentoran unit. The Swifts approached the game on the back of a horrible statistic as they hadn’t picked up three Danske Premiership points since September 12, when they defeated basement side Warrenpoint Town. Although the wait for a win continues, their display in east Belfast suggested there are better days up ahead. It looked so good when Andrew Mitchell headed home a wonderful cross by the impressive Paul McElroy just after the break. But, as on so many occasions this season, the Swifts conceded soon after, leaving Jonathan Smith free in the penalty area and he finished with a certain degree of panache. The goal also helped spare the 19 year old’s blushes as he had a first half penalty kick saved by veteran goalkeeper Andy Coleman. “The boys all turned in a committed performance and I think we deserved a draw,” said McAree. “I don’t think we did enough to win the game... and I don’t think Glentoran did either. “My only disappointment was the fact we conceded the equaliser just a few minutes after taking the lead. That has been a problem for us this season and it’s something we need to address. McAree was also thrilled with the performance of McElroy, who was unlucky to see his rasping 30 yard drive flicked over the top by Glens keeper Elliott Morris in the first half. McAree added: “I thought he (McElroy) was a wee bit on his heels in the first 45 minutes. I spoke with him at half-time. I asked for a wee bit more in the second half. “I thought he made a good contribution overall. He sent in a great ball for our goal. He put it into a great area and big Mitch did well to attack it and get his head on to it. Glentoran manager Alan Kernaghan admitted it was a difficult day ‘at the office’. “I was really frustrated out there,” he said. “We did so many good things, but we just lacked a cutting edge. I was pleased off lots of stuff, it’s just a pity we didn’t get the three points. “The penalty miss was significant. In games like this, the first goal is always important. “Had it gone in, it meant Dungannon would have had to come out and open up a little bit. It’s only my third game in... and one of those was a cup tie. I’ve seen lots of things to be encouraged.